MANILA, Philippines - The official results, list of passers, top examinees, performance of schools and other important announcements for March 2017 Board Licensure Exam for Teachers (LET) both for elementary and secondary levels are released by the Professional Regulation Commission (PRC) 40 working days after the last day of board examination. 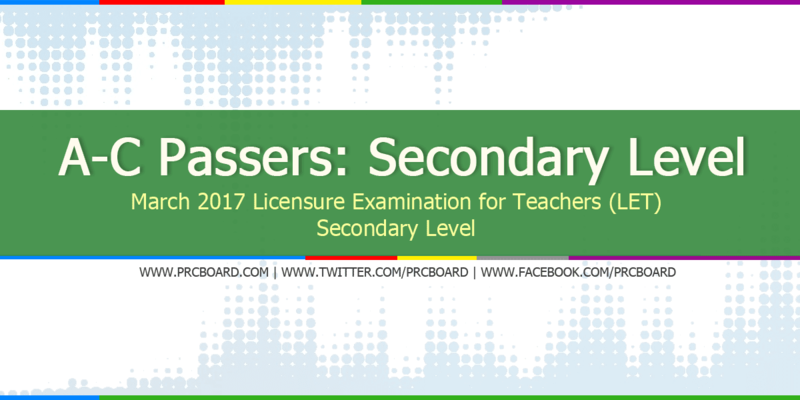 Below is the list of passers for March 2017 LET (Secondary level) with surnames starting with letter A to C.
5270 CUÑADO, MARIVIC SOMOZA Licensure Examination for Teachers or LET is currently the most-numbered examinees being administered by PRC. LET for elementary and secondary levels are scheduled twice a year to cater the growing number of aspiring professional teachers. For 2017, LET exams are scheduled on March 2017 and September 2017. The board exams are administered by the Board of Professional Teachers headed by Dr. Rosita L. Navarro at PRC testing locations around the country specifically in Manila, Bacolod, Baguio City, Catarman, Cebu City, Davao City, General Santos City, Iloilo, Legazpi, Lucena, Occidental Mindoro, Palawan, Rosales, Pangasinan, Tacloban, Tuguegarao, Pagadian and Zamboanga City. According to PRC, a LET taker must have not less than 75% average rating and not less than 50% in any of the tests in General Education, Professional Education and Area of Specialization (if applicable) to successfully pass. To receive updates on any announcements about March 2017 LET Teachers board exam results, we advise our readers to bookmark this page, visit PRC official website or follow us at our social media pages via Facebook and Twitter. kailan po release ng passers? anong oras po namin malalaman ang result? yeah! because He is the reason why We are here. what time lalabas ang result? kailan po lalabas result? basta ngayon ba talaga? Kelan po talaga ang release ng passers? Nakakakaba lalo habang tumatagal eh. Lord,bless me for this result. Let me pass oh God. wala na sigurong office ang PRC ngayon, bukas na siguro sila mag release. may 19 na po. asan na po yung result? To God be the highest glory! Baka bukas meron na. Tulog na ako para mabawasan ung kaba. Ang aga ko gumising ngayon para mag internet wala parin result...kelan po ba tlaga..
Ang sabi 30-40 working days eh may semana Santa tsaka labor day so wala pang 40 working days. Baka by next week na yan. grabeh ang tagal... may 20 na wla parin? yehey, sana sa 24 may result na po..
bakit wala parin po ? Ang sabi po samin sa !may 22 daw po. Ung nag sabi sa amin nito sya din yung nagsabi kung kailan ang release nung last sept. At tama po yung binigay nyang date ng release ng result. Monday na po yan.. Wait nalang tayo. Sana po pasado kaming lahat.. Amen! May 22 pa sabi sa nabasa ko sa website nila pero may post din sa passers pag ni search mo is May 19 di ba? Claim it! Pasado na! yaay!! anong oras labas po ng result? meron nang TOP 10 sa Secondary! graveh..nakakaiyak..u don't know what to do while waiting.TO GOD BE ALL THE GLORY..AMEN. ilinabas na yung elementary nga un lang..
Anong oras po yungh sa BSED?